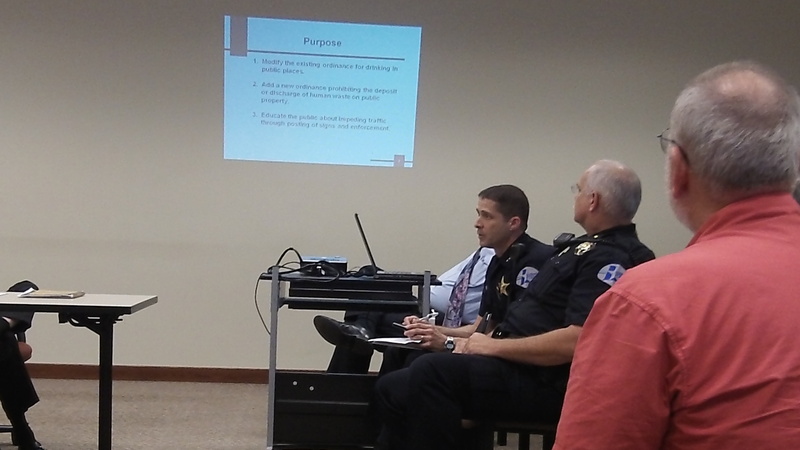 Police Chief Mario Lattanzio, left, and Lt. Casey Dorland talk to the council Aug. 12. Now that they have the tools for a renewed campaign against unlawful behavior by vagrants, Albany police will have to use them. The city council Wednesday passed ordinances against open containers of alcohol in public places, and against relieving oneself in public. Having laws is one thing. Applying them is something else. For that, the police have to see these misdemeanors being committed, and to see them, they have to be there. Foot patrols, or at least more bike patrols, will have to be mounted more often. Some of the excessive drinking goes on in places where patrol cars can’t go. Much of the mess from unauthorized camping is left in the brush along the banks of the Willamette and Calapooia rivers and other places you can’t see from the road. Citizens can help by reporting these things or recording them. One resident at Wednesday’s council meeting waved a compact disc recording of something unpleasant he had seen since he complained about the same thing at a council work session two days before. From Rolland Brower, via Facebook: Thanks to our mayor, Sharon Konopa, for pushing and getting these much needed ordinances passed! It something we have dealt with for many years on City property near ours. From Gary Whitehouse: So, Hasso, how does this affect those firefighters’ “fill the boot” events? I’m all for firefighters, but I for one dislike their tactic of standing in traffic lanes to solicit donations. I think they’re intrusive, coercive and potentially dangerous. At least your average “Anything Helps!” beggar stays on the sidewalk until a driver signals his or her intent to give.